Background: Students need emotional intelligence (EI) for their better academic excellence. There are three important psychological dimensions of EI: Emotional sensitivity (ES), emotional maturity (EM) and emotional competency (EC), which motivate students to recognize truthfully, interpret honestly and handle tactfully the dynamics of their behavioral pattern. Objective: The study was designed to assess ES in the students undergoing yoga therapy program in the form of yoga instructor's course (YIC) module. Materials and Methods: One hundred and eighty four YIC students with 25.77 ± 4.85 years of mean age participated in this study of 21 days duration (a single group pre-post design). The ES data was collected before (pre) and after (post) YIC module using Emotional Quotient test developed by Dr Dalip Singh and Dr N K Chadha. Statistical Analysis: Means, standard deviations, Kolmogorov-Smirnov test, and Wilcoxon signed rank test were used for analyzing the data with the help of SPSS 16. Results: The data analysis showed 3.63% significant increase (P < 0.01) in ES. Conclusion: The present study suggests that YIC module can result in improvement of ES among university students, thus paving the way for their academic success. Additional well-designed studies are needed before a strong recommendation can be made. Today's students are more concerned with the technical aspects of various professions and more emotionally immature compared to previous generations of learners. , Emotional intelligence (EI) in students most commonly involve concepts of self-awareness, empathy, emotional expression and regulation. Emotional sensitivity (ES), emotional maturity (EM) and emotional competency (EC) are the three important psychological dimensions of EI, which motivate student to recognize truthfully, interpret honestly and handle tactfully the dynamics of their behavioral pattern. Many corporations and institutions have examined and to some extent used EI as a measure of these concepts and domains, which some speculate are better predictors of educational and occupational performance. , In the psychological sense, ES means the characteristic of being peculiarly sensitive and judges the threshold for various types of stimulations, evoking sensations, feelings and emotions. The students may seek to evolve the ES characteristics in their personality: understanding threshold of emotional arousal, empathy, improving inter-personal relations and communicability of emotions. Recent study on yoga based self management of excessive tension (SMET) in managers published in prestigious Industrial Psychiatry Journal suggest that yoga is associated with improvement in EI combined with ES, EM and EC, thus leading to mental health promotion in managers indicating yoga as a powerful tool for their effective stress management. However, the changes in ES that characterize the efficacy of yoga instructor's course (YIC) module based on integrated approach of yoga therapy (IAYT) for students have not been reported adequately. Hence, the present study was designed to assess the efficacy of YIC module on ES in university students. The objective was to assess ES in university students undergoing YIC module. One hundred and eighty four YIC students with 25.77 ± 4.85 years of mean age participated in this study. Age between 18 and 37 years (males and females), physically and mentally fit to undergo training of YIC module and understand giving responses to psychological testing. Students with serious medical conditions, taking medication and using any other wellness strategy, psychiatric drugs, alcohol, or tobacco in any form. Subjects for the present study were selected from Swami Vivekananda Yoga Anusandhana Samsthana (S-VYASA) University, Bangalore undergoing YIC module. An informed consent was obtained from all the participants. The study was approved by the IRB of S-VYASA University, Bangalore. Emotional quotient (EQ) test (available online free of cost at www.eqindia.com/EQ TEST.PDF) developed by Dr Dalip Singh and Dr. N K Chadha was used in this study. ,, The test has 22 real-life situations experienced by individuals in their day-to-day life based on 5-point scale rating and then finally obtained scores that was converted into percentile score. This test is useful to measure emotional dimensions like EC, EM and ES. This test has been standardized for professional managers, businessmen, bureaucrats, artists, and graduate students and adolescent population. This EQ test has a test-retest and split-half reliability of 0.94 and 0.89, respectively and validity of 0.89. The ES data was collected before and after the 21 days of YIC module. It was based on interpretation of ES scores in percentile [Table 2]. Data analysis was carried out using the version 16.0 of the Statistical Package for Social Sciences (SPSS) software. The Kolmogorov-Smirnov test showed that the data was not normally distributed. Wilcoxon signed rank test was used to compare means of the data. Yoga is thought to bring physical, psychological and spiritual benefits to practitioners and has been associated with reduced stress and pain. An extensive and standardized teacher-training program support reliability and safety of YIC module. Goleman  claims that about 80% of a person's success in life depends on emotional competencies, emotional maturity and ES as measured by Emotional quotient. In the present study, the data analysis showed 3.63% significant increase (P < 0.01) in ES between pre and post intervention measurements [Table 3]. One way to understand yoga's strong positive effect on EQ is that it first increases alertness (exemplified by increases in sustained attention); next it erases negative influences on personality (exemplified by decreases in Tamas or dull personality trait); and finally this leads to increased sensitivity to others' feelings and emotions (exemplified by increases in Sattva or balanced personality trait). Previous report on SMET program in general and Cyclic Meditation in particular revealed significant increase in EQ and thus strengthening the importance of yoga for increased ES. , Similarly, yoga based SMET program reported significant improvement EQ and other health variables indicating positive impact of yoga module on ES. The present study is consistent with these findings, suggesting that a systematic adoption of the YIC module can result in better ES among students for their academic success. The result from the present study suggests that YIC module was associated with improvement in ES, thus paving the way for their academic success. Additional well-designed studies are needed before a strong recommendation can be made. Authors acknowledge Swami Vivekananda Yoga Anusandhana Samsthana (S-VYASA) University for granting permission to carry out this work. 1. Romanelli F, Ryan M. A survey and review of attitudes and beliefs of generation X pharmacy students. Am J Pharm Educ 2003;67:1-9. 2. Ryan M, Romanelli F, Smith K, Johnson MM. Identifying and teaching Generation X pharmacy students. Am J Pharm Educ 2003;67:1-7. 3. Romanelli F, Cain J, Smith KM. Emotional intelligence as a predictor of academic and/or professional success. Am J Pharm Educ 2006;70:69. 4. Singh D. Emotional Intelligence at Work: A professional Guide. New Delhi, India: Sage Publications; 2003. 5. Goleman D. Working With Emotional Intelligence. New York: Bantom Books; 1998. 6. Goleman D. What makes a leader? Harv Bus Rev 1998;11-12:92-102. 7. Ganpat TS, Nagendra HR. Integrated yoga therapy for improving mental health in managers. Ind Psychiatry J 2011;20:45-8. 8. Khemka SS, Ramarao NH, Hankey A. Effect of integral yoga on psychological and health variables and their correlations. 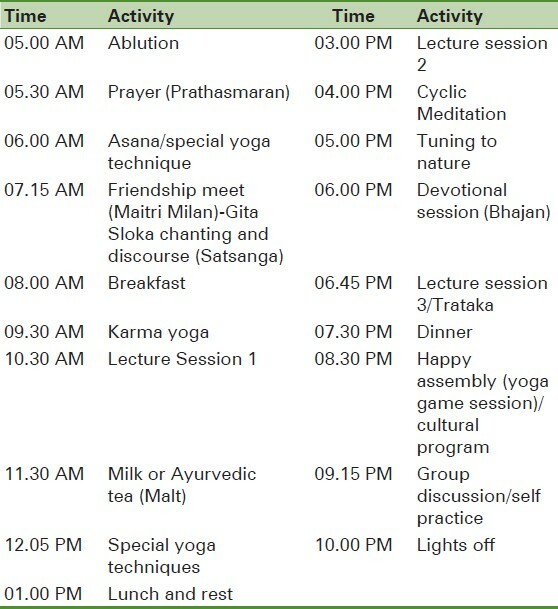 Int J Yoga 2011;4:93-9. 9. Deshpande S, Nagendra HR, Raghuram N. A randomized control trial of the effect of yoga on verbal aggressiveness in normal healthy volunteers. Int J Yoga 2008;1:76-82. 10. Lokeswarananda S. Taittiriya U. The Ramakrishna Mission Institute of Culture: Calcutta: Ramakrishna Mission 1996. p. 136-80. 11. Kumar S, Nagendra HR, Manjunath NK, Naveen KV, Telles S. Meditation on OM: Relevance from ancient texts and contemporary science. Int J Yoga 2010;3:2-5. 12. Ganpat TS, Nagendra HR. Yoga therapy for developing emotional intelligence in mid-life managers. J Midlife Health 2011;2:28-30. 13. Goleman D. Emotional Intelligence "Why it can more matter than IQ" New York: Bantam Books; 1996. 14. Adhia H, Nagendra HR, Mahadevan B. Impact of yoga way of life on organizational performance. Int J Yoga 2010;3:55-66. 15. Subramanya P, Telles S. A review of the scientific studies on cyclic meditation. Int J Yoga 2009;2:46-8.